As soon as the theme Connected came up, I knew that I wanted to use my inspiration from our trip to Russia. Being there I was in awe with all the domes, that rises to the sky as to connect with a Higher Spirit. One of my pictures I turned into a sketch on Photoshop Elements and enlarged it on a photocopier. I then traced it on the satin background that was made with transfer paint. The domes are made by a technique of applying foil to fabric I learned from Melody Crust in a workshop in Houston. It was tricky to put one on top of the other, but it worked. Two domes are made with handmade stencils and paintsticks. The rest has been hand painted with textile paint. The bushes on the bottom are made by cutting very small embroidery thread, covered with chiffon and quilted with stippling. Windows are quilted, as are the lines on the domes and the outlines of the building. The sky is quilted in vertical lines to emphasize the connection to above. This is a beautiful piece, Els! And your process was fascinating! Els I just love your creative work. 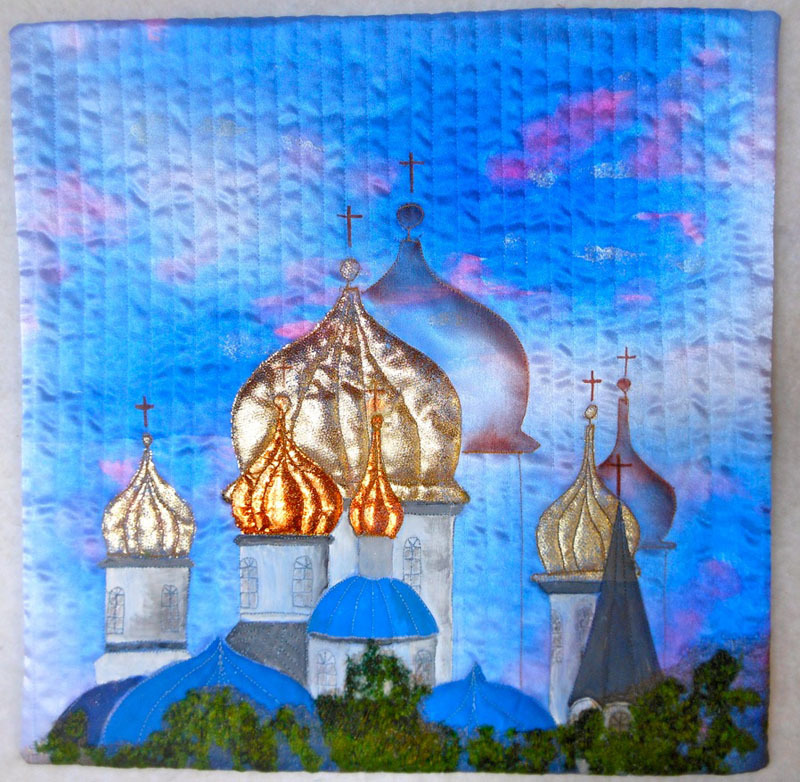 This quilt is superb and you have captured the feeling of Russia perfectly. I was in St Petersburg earlier this year and I appreciate your interpretation of the spires.